Continuous row of diamonds is the center in this pretty diamond wedding band. This diamond band design measures 6mm in width and SI 1 g-h color diamonds total .94ct tw. You'll love this clean classy design, it's part of our new custom design collection. This ring is part of our custom made to order collection and is available in 14k yellow, rose, white or a combination, 18k yellow, rose, white, combination, and also Platinum 950. Custom width also available. Any size also available, custom made items are non returnable but allows us to give our customers the ring the perfect ring. It's simple, your buying the ring, you decide how it should look, just drop us an email for pricing. Gorgeous dual diamond design wedding band. This wedding band features a double milgrain line center with gypsy set diamonds bordering either side. Diamonds are SI 1 clarity g-h color and total .48ct tw. This ring measures 7mm wide and is shown with a polished center and matt finish either side around the diamonds. 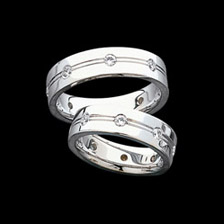 Ring sizing is FREE on this fabulous diamond wedding band. 14k White Gold Baguette Diamond Wedding Band. 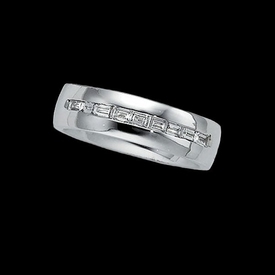 Fantastic design, this 14k White Gold band measures a nice 6mm wide and holds 9 baguette diamonds. Available in a ladies or gent' s selection. 14k White Gold 1/2ct tw Diamond Duo wedding band. Band measures 6mm wide. This very nice diamond wedding band is set with 6 2.5mm round diamonds that are SI2-I1 clarity, G-I color stones. Attractive wedding bands. Stock Size Ladies 7; Gent's 11. 14k Yellow Gold diamond wedding band. 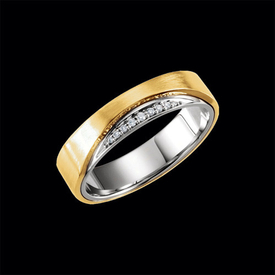 This wedding band measures 9.5mm wide at the top and holds 1/3ctw diamonds, unique design. Wide band weighs 10.29grams for the ladies selection and a big 13.41grams for the gent's. Diamonds are SI 2 G-I color. 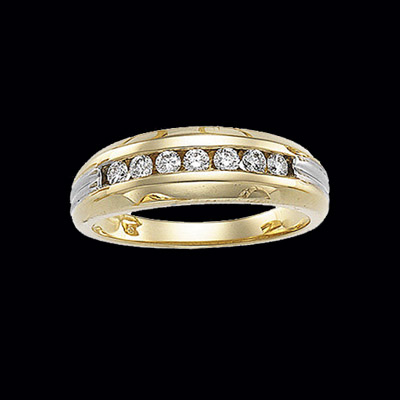 14K Yellow Gold and accent diamonds create this attractive band. Diamond weight .06 in ladies, 1/8ct tw in Gents. 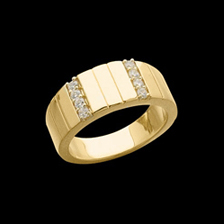 This band measures 6.5mm wide and is a stock size 7 for the ladies stock size 11 for the mens ring. 14k White Gold Princess diamond center wedding band. Diamond wedding band measures 7mm wide. Center diamond measures 3mm square, great design matched duo bands. Price is for the ladies size 7. 14K Gold Two Tone 3/8ct tw Diamond Band. An attractive and popular choice. Diamonds are channel set in this ring, each on is .06ct. Ring weighs 8.41grams.